An incomplete lead alloy unifaced token, of Medieval to Post Medieval dating (AD 1300 to AD 1600). The token is sub circular in shape. The obverse depicts a seven raised lines intersecting in the middle, creating fourteen segments (Powell type 3). The reverse is plain and undecorated. The token has a diameter of 21.1 mm, and is 2.4 mm thick. It weighs 4.4 g.
The token is a mid grey colour, with an even surface patina. 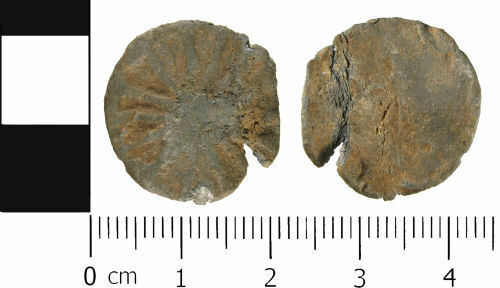 Lead tokens are a frequently occurring find, with a variety of different designs. Tokens like this, were used as tallies or as replacement low denomination coinage during the Medieval and Post Medieval periods.